When: July 17th, 2001 (age 35). 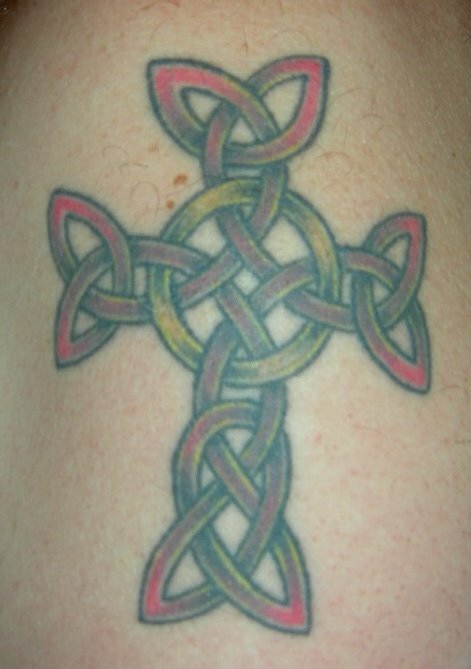 What/Where: Large (5" tall x 3 " wide) celtic knotwork cross centered on my left deltoid/shoulder. 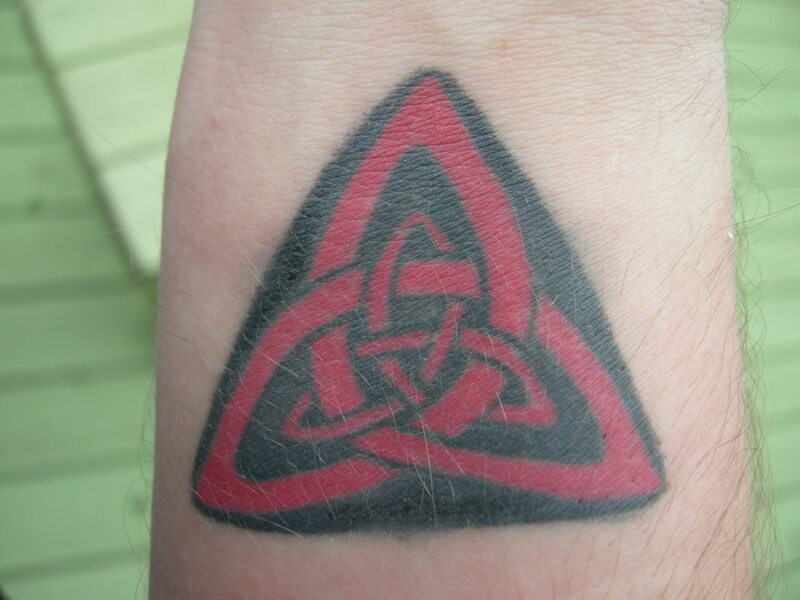 I'm Scottish, so the celtic knotwork is red, not green. The upper portion where the vertical meets the horizontal there is a gold circlet interwoven with the cross. I saw something like it online, and printed the picture. I brought it (and the color version on my laptop) to the artist and he re-vamped it into an original design. How much: $200 & I bought the artist and his girlfriend dinner so they'd stay open late and do it after hours, instead of making me come back later! =O) Took around 1 hour to draw and design, then about 1 hour of "buzz time." You know the 4-sided stand-up cheese grater everyone has? There is the "slice" side, and the "grate" side, and then two "shred" sizes: medium and small. Imagine a small steel tool shaped like a small ruler. Imagine it has just one (1) medium-sized shredder hole in it. 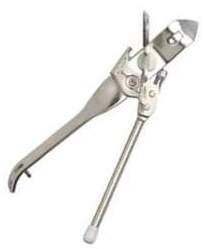 Now imagine the artist placing his/her thumb against the back of the tool, pressing the "shred" hole against your flesh with medium pressure, and then dragging it around. Now imagine the nerve endings getting overloaded, so it gets less sensitive after 40 minutes or so. The artist's girlfriend kept asking me "does it still hurt?" I told her, at one point: "Well, it's weird. It doesn't really hurt anymore. Now it feels like the act of doing the tattoo is making the skin itch really bad -- but then the act of doing the tattoo is also *scratching* that itch -- so it. Actually. Um. Feels. Um. Kinda good." At this point, as I'm hearing the words leave my mouth, I'm thinking "Oh no, I think I've crossed some sort of line here..."
But then the (tattoo-covered) artist stopped, and looked up at me with a wide-eyed wonder that faded into a sly smile as he said "No, you're right -- it feels good doesn't it?" I knew right then the reason some people have so many! Why: I had been thinking of doing this for years, but always held back for some reason. Last July I had just returned from a Pastor's conference. One of the main speakers was a man named Leonard Sweet, who is a voice on Postmodernism. I am interested in this societal shift, so I found his lectures and workshops really inspiring. Something he said really struck me. I have always seen myself as firmly in the middle: born in 1965 means I am neither a "Boomer" or a "Buster/Xer" -- I'm a "Cusper". Len was trying to bring definition to thought patterns and paradigm differences and said something like "Boomers see tattoos as something that sailors, bikers, and prisoners have. 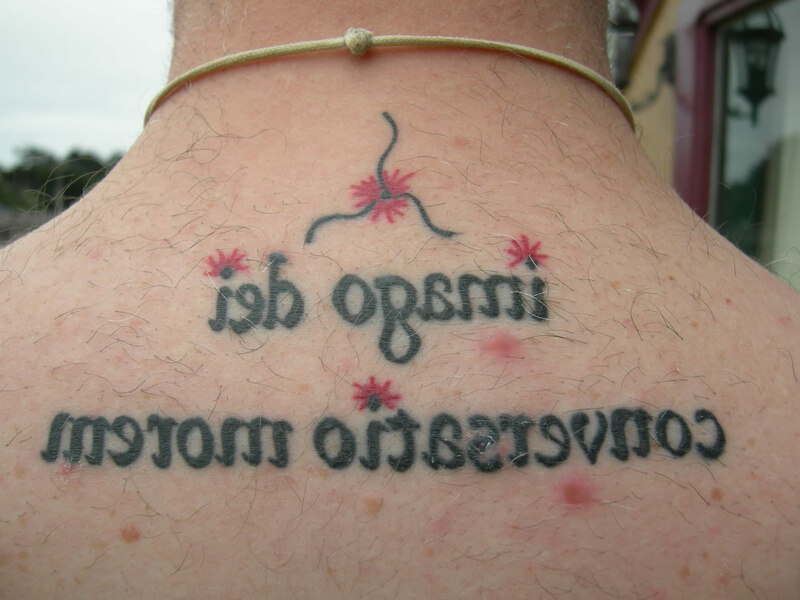 PostModern thinkers see their bodies as a canvas on which they tell their story." It dawned on me that all 5 of my ear piercings (2 left lobe, 1 left top, 2 right lobe) were part of my story -- all marking significant events. So I quit thinking of myself as having to be "in the middle" and felt released to get the tattoo! I also felt released to really "be me" for God. SO I chose this design as a way to celebrate that new dedication to following Jesus and "carrying my cross daily." What/Where: Life-size 3D two-shaded green rose stem (with thorns) in a celtic knot weave around my right ankle. On the outer aspect of my ankle, a shoot branches off the anklet weave and snakes up the outside of my calf (with a couple leaves on the stem), ending in a life-size yellow rose bud. On the inner aspect of my ankle, one of the thorns is "poking" my flesh and so there is a tiny drop of red blood there. 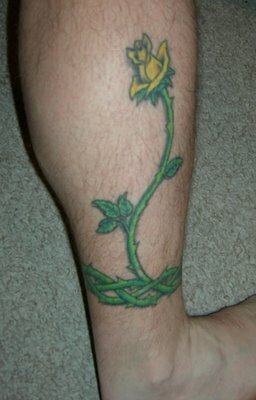 The whole tattoo is back-shaded and drawn such that it looks at a glance like it is a real rose wrapped around my leg. It was an all original design that I thought up and commissioned the artist to do. This one was done at the same shop, this time by the owner. How much: $400, but I think I got off easy. He did a lot of detail work. Great guy. Took about 2 hours of design time and 4 hours of buzz time. My appointment was at 9pm, we started buzzing at 11pm, and I was walking out the door at 3am! 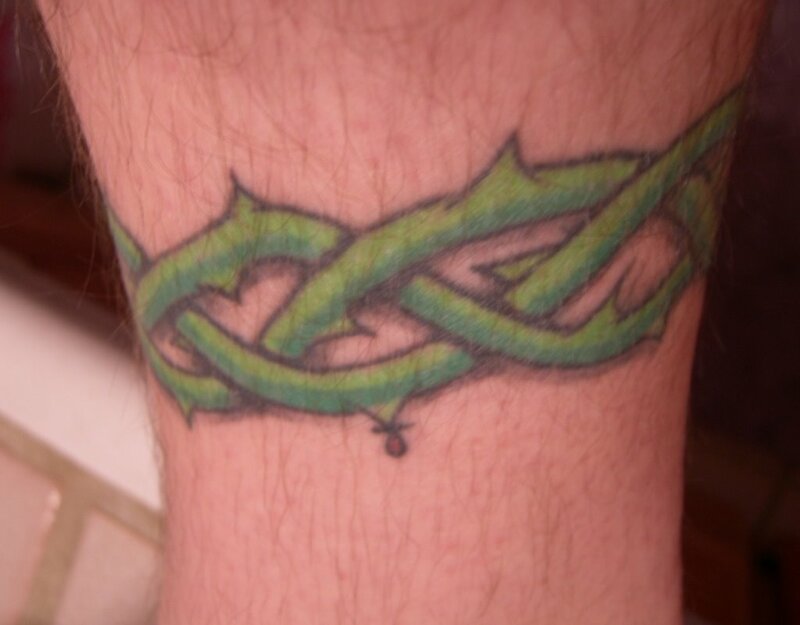 Pain: This one hurt worse than the cross, as he had to go back over areas more for the 3D shading and extra colors. Why: My mom died on Memorial day that year, just a few short days before her 68th birthday. She was from Texas, so I chose a yellow rose. The part on my outer calf symbolizes my celebration of her life for the world to see. The anklet stem/thorn weave symbolizes the firm foundation she gave me in life and my faith. The small "poke" with the drop of blood on the inside of my ankle symbolizes my pain at losing her -- more private and less visible to the rest of the world, yet still there, still significant, and still something I'll carry always. Pain: It was pretty painful at first, but by the time it was getting numb, it was over. Why: Trinity: three-in-one nature of God. In a way, I am also three-natured. I have a body, a mind, and a spirit. The two symbols interwoven then, represent me hidden in God, or God lilving in me. It is on my right wrist to remind me this is where I meet people, and right where He met us. What/Where: This one is on my upper back, just below my collar line. It is a symbol, followed by some words. See picture and explanation below: How Much: $140. Took about an hour of design time and about 45 minutes of buzz time. Pain: Surprisingly, there was very little pain, except as he got right in the middle of my back. Otherwise it was really just a feeling of pressure, sort of. Why: For awhile, I've noticed I sometimes forget who I am -- forget whose I am -- who I am made to be. The words "imago dei" are Latin for "Image of God". Putting that phrase, in that place, is like a tag on a shirt -- it is a reminder of who made me, what "line" I am a part of. The words "conversatio morem" are Latin for "constant conversion" or "death to the status quo". I first heard about this phrase from my friend Keith Giles, who wrote an article about it here. For me, it is a reminder I am still in process; not yet finished. Also, it speaks to me of an active participation with God in all He is doing in me. It speaks not only of being out of the boat, but staying there. Also, the conjugation is not singular. It is not "conversation morum" which would be just about me. It is "conversation morem" -- it is about all of us. and for me it is also about the unique part I have to play in the grand scheme of things God is doing in the life around me. If you hadn't guessed, the letters are backward so when I look in the mirror (the only way I can see it) I can read it. The symbol has many meanings. It is trinitarian, but also has two other meanings. It is symbolic of salvation: God reaching His arms down to us from above. It is also symbolic of convergence: two paths becoming one. The lines are squiggly to imply constant motion. The red accent at the center of the symbol, as well as the dots above each i provide symmetry and also a flash of light; radiance from within. I'm not sure yet what my next tattoo will be. So far each one has had deep meaning to me as well as being a marker; a milestone for really significant events in my life. I'm sure I'll get more. At some point I think it would be cool to get the same tattoo with someone else, at the same time -- a shared experience marking the same event in our shared lives.